The Eastern Diamondback Rattlesnake (Crotalus adamanteus) is a large heavy bodied pit viper. It has large diamond-shaped markings outlined that are normally a black to grey color. The diamonds are outlined with white on a brown, gray, yellowish, or even black background. They have a distinctive rattle at the end of the tail. They also have a light stripe that goes down on each side of the face. Juvenile Eastern Diamondback’s color pattern is the same as the adults. They are the largest venomous snake in North America. They can reach lengths up to and over 8 feet with the largest recorded was at 8ft 3in. The Eastern Diamondback Rattlesnake’s habitat includes the longleaf pine/saw palmetto fields, lower coastal plains, sandhill habitat, and coastal islands with comparable habitat. This snake can often be found near a gopher tortoise colony since they use the tortoise’s burrow for cover and hibernation. They can also sometimes be found under pieces of tin or crossing the road in the morning and evening. They have also been found in Pine Plantations where quail and small rodents thrive. The Eastern Diamondback’s primary food source is rabbits. They will also eat squirrels, cotton rats, voles, and cotton mice. The Eastern Diamondback Rattlesnake has been coming increasable uncommon. They are endangered in several states including North Carolina. This snake, which used to be everywhere in the southeast, population has been decreasing in the last 20 years. One big reason is the hunting (Rattlesnake Roundup) for these snakes, which still goes out through the southeast. The rattlesnake roundup is when they go out and catch as many rattlesnakes as possible, and then they will chop their heads in the end and eat them. This is a very cruel and vicious act. 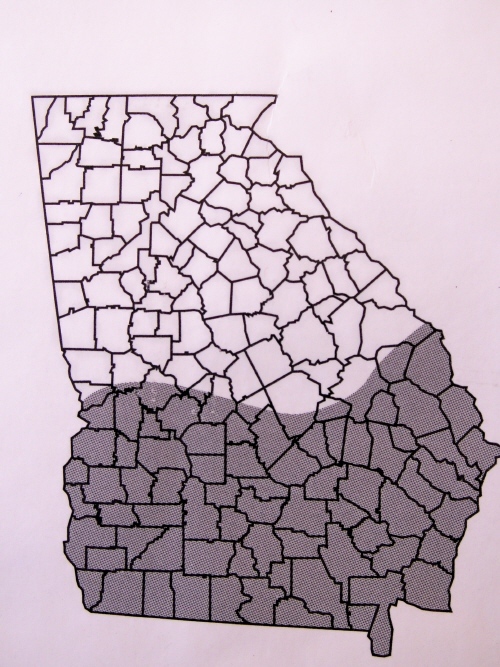 The snake is very secretive, and on only a rare occasion this snake will come across people in the southern counties of Georgia. This snake is mostly crepuscular (comes out at dawn and dusk). The reason for this is that its favorite food source, which is rabbits, are out at this time too. They are almost strictly are found out during Daylight unlike their close cousin the Timber/Canebrake Rattlesnake (Crotalus horridus). The Eastern Diamondback hibernates through winter except for the portion of Southern Florida which stays warm year round. In spring they can be found right next to Stump holes which they hibernate in during winter. Also they can also be found near Gopher Tortoise holes where they all hibernate in winter. They can be found occasionally around the borders of swamps where there is a Saw Palmetto. Okefenokee Swamp is a place like that.